In this video I show you how to take some baseball data from a website, create a SQL Server table, and insert it into the table. How to use the Create Table Statement to store data in SQL Server.. Here is the Homerun Leaders Page that I use for the data. See the original SQL Create Table video. In this video, I show you a trick on removing duplicate rows in SQL Server 2012. How to Remove Duplicate Rows in SQL Server? I first need a table that has duplicate records to remove, so here is a script to create some duplicates in an email address table. Now, the first method to remove the duplicates is in the following script that I adapted from Alexander’s Post on duplicates. If you just look at the SQL With statement (CTE), you will see that it simply numbers all of the name, email combinations using the Row_Number function. 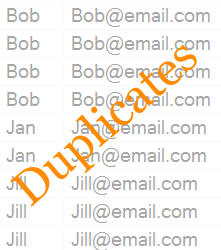 Then it uses the minimum rows number per name, email group as an exclusion to remove the duplicate rows. The second script is and adaptation of Ritesh’s Post on duplicates. If we focus on the CTE query, we see that is uses the Partition By statement to actually reset the row_number count on each name, email group. It makes the delete statement a little easier to follow since all we have to do is delete where the row_number (duplicate_count) is larger than 1. And that’s it. That is how you Delete Duplicates in SQL.